Don't Take Us for Granted! 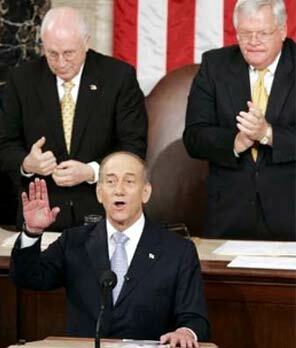 http://www.JewishWorldReview.com | Ehud Olmert emerged from his first meeting as prime minister with President Bush sounding as if the conclave couldn't have been more to his liking. The extended face time he had with the resident of 1600 Pennsylvania Avenue and the cheers Olmert received when he addressed Congress last week are being put forward as a personal triumph for him as well as for his new government. Olmert vowed to follow up on the success of his visit to Washington by visiting Europe, as well as Egypt, to drum up international support for his "realignment" plan (formally known as "convergence," and before that, as merely unilateral withdrawal) by which he proposes to pull back from parts of the West Bank and thus permanently draw Israel's boundaries without the permission of the Palestinians. But even before the echoes of congressional cheers for Olmert's thoughtful address had died down, his rival for American love and largess issued a statement that showed just how slender the prime minister's margin for error in this game really is. Two days after Olmert's tete-a-tete with Bush, Palestinian Authority President Mahmoud Abbas proclaimed to the international press that he would call a referendum on a proposal for a Palestinian state that would recognize Israel, if the governing Hamas party failed to accept the plan within 10 days. Abbas is a marginalized figure within his own government and people. But despite this, all it took was for the Palestinian to say a few magic words  and a great deal of the air went out of Olmert's post-Washington summit balloon. What Abbas did was endorse a so-called peace plan hatched by a committee of members of Hamas and Abbas' Fatah movement currently serving lengthy terms in Israeli prisons for terrorist murders. But despite the fact that they could draft it at their leisure, all the prisoners did was adopt a similar "peace" plan floated by the Saudis in 2002. The Saudi plan was a hoax launched in order to counter all the unfair bad press they were receiving in the months after 9/11. With the connivance of The New York Times' Thomas Friedman, who trumpeted the scheme as a scoop in his column, the Saudis managed to convince some Americans that a plan that called for Israel to pull back to the 1949 armistice lines, accept the Palestinian "right of return," which would destroy it as a Jewish state, in exchange for de facto recognition, was a step toward peace rather than more war. Israel rightly rejected the idea at the time and will, no doubt, do so again. But that didn't stop the international press, as well as some American Jewish "peace" activists from touting it not only as a sign of Abbas' moderation but as a real opening for peace that ought to trump Olmert's unilateralism. It isn't clear that Abbas' gambit will afford him more than a momentary tactical advantage against both Hamas and Olmert. But what it does illustrate is how precarious Olmert's hold on international goodwill is. After all, the price he had to pay for the warm reception he got at the White House was to agree to stop telling the world that Abbas was not a negotiating partner and had proved that he wasn't interested in progress toward peace. But Abbas, despite his unwillingness to use any of the considerable force at his disposal to stop attacks against Israel, can still count on more support here than Olmert seems to understand. Olmert is acting as if his plans will carry the day, no matter what else happens. Those of us who believe that any democratically elected leader of Israel is entitled to more than the benefit of the doubt hope he is right. But Israelis ought to care about the reason why, against all reason, Abbas is still sitting in the proverbial catbird seat when it comes to leverage in Washington. First, despite George W. Bush's obvious and genuine affection for the State of Israel and the much-vaunted power of the Israel "lobby," Washington still has bigger fish to fry than Olmert's ambitions for a relatively quick resolution to Israel's problems in the territories. Olmert wants (though he didn't have the chutzpah to ask for it on this trip) some additional $10 billion in aid to cover the costs of carrying out the uprooting of some 70,000 Jews who live in places in the territories that the government envisages giving up in the next round of withdrawals, as well as for their resettlement elsewhere in Israel. But Israelis need to remember that America is spending more than a billion per week in Iraq. And though, despite the entreaties of some of our Arab and European "allies," Bush has refused to ditch Israel in return for more support on Iraq. He is highly unlikely to do anything that will rile up even more anger in the Arab world than we have already suffered. Which is to say those members of Olmert's Kadima Party who actually think that the United States  let alone Europe  will endorse unilaterally drawn borders ought not to be holding their breath waiting for such a statement. Second, one of the main audiences where Abbas' overtures are playing well is among American Jews. Ironically, unlike the hard-core supporters of Israel in both the Republican and Democratic caucuses in Congress, who not only cheered for Olmert last week but passed a bill calling for heavy restrictions on aid to the Palestinians that the White House thought was too tough, many American Jews are more interested in giving Hamas a chance. The vocal opposition by some left-wing Jewish groups, including the Israel Policy Forum (to whom Olmert floated his withdrawal plans at a dinner last year) to the legislation calling for an aid cutoff to a Hamas-led P.A. should be a wake-up call that he cannot count on wall-to-wall Jewish support for unilateralism. The welcome given the prisoners "peace plan" in the press ought to reinforce the danger. But rather than answer the challenge from the left here, Olmert and his people are still far more interested in quashing the lingering carping they still hear from those who oppose any withdrawals. That's understandable given the bitter battle Olmert fought with the right, first within the Likud and then in the general election he won this year as head of Kadima. But there is no getting around the fact that no matter how much more territory Olmert's government is prepared to give up, there will still be a powerful chorus in this country and Europe wanting more. Should his "realignment" plan actually be implemented, it will be followed by more protests focused on getting Israel to pull back even farther to the 1949 armistice lines, including those in Jerusalem. And the thing he ought to be most worried about here is the slippage in Jewish support for Israel, even an Israel that is committed to massive withdrawals. Rather than wasting his time trying to get international support for unilateralism that will never come, maybe Olmert should concentrate more of his efforts on stopping the bleeding in the pro-Israel community. Red carpets in London and Paris are no substitute for the ground lost to Abbas and Hamas here.